Now here is a simple question. You have the NSE EOD database for amibroker. ( If not you can download the NSE EOD database – updated upto 28 July 2010) and the stocks in nse is more than 1300 symbols. Now all you need to do is you have to find the list of stocks that had recently made 5/20 EMA crossover from the bunch of NSE Stock pack and also you have to scan the stocks with price value greater than Rs50. 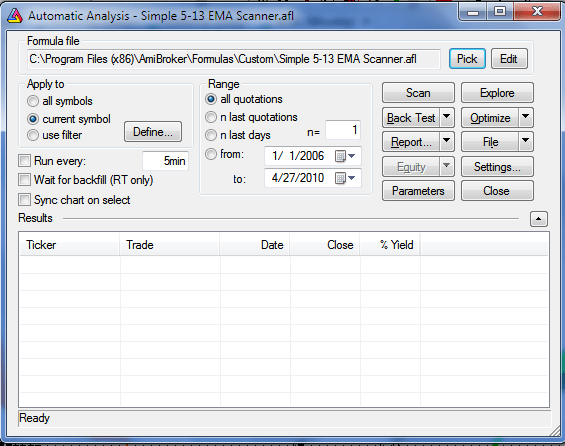 And also print the values of 5EMA and 20 EMA values for those corresponding stocks. cross function is used to identify the crossovers and C in the above notation denotes the Close price. Select Explore button to start filtering the stock database and the results of EMA 5/20 crossover will be published along with the technical data 5EMA and 20 EMA values. And we will work out some of the famous stock scanning methods in upcoming sessions step by step. 1.5 gives 5 decimal digits, 1.0 gives no decimal digits as output. And the integer part of this number can be used to pad formatted number with spaces here it will be spaced with one character in the above example. Thank you very much. I am interested in MACD above 0 line and bullish cross over.There are some bolgspots which gives MACD Bullish Cross Over. But I need at the same time MACD to be above 0 line. How to do. Please help me. Thank you very much. I noticed just now. Thanks for the above.Please tell me the afl for 5/20 ema cross over for amibroker.Earlier u had given afl for 30/1070 for intraday.Please do the need ful. In the profit table for which the afl is put up could you please explain how the profit for the month is calculated? Could you also please verify the accuracy as I found some major differences with eod data. Also is any gann afl for drawing the 45 degree lines available with anyone here. can u pls guide me how can i learn so? ur blog is very informative and usefull. specially information about new data-feed softwares. Iam intrested in sharing more simple strategies with amibroker to understand it in a better way to built complex strategies. will write more about the afl strategies. Akki iam holding this afl got from traderji.com long time back… and this is the source of inspiration to write the above post. And Thanks! for posting those AFL codes. Making! 50% in a week…. man you are damm crazy! @Ravi will post tommorow morning…. Can you please send me the AFL to my mail id. As I am getting lot of errors and I am new to Amibroker. Thanks a lot for starting this wonderful thread. The abv afl was shared with me by one of my friends & i am always there to hlp the family. hello sir , i am not so experienced with amibroker, specially how to use afl. but today in inditraders i saw a afl by karthikmarar( a famious contributer in inditraders), that is “trend manager”. i have downloaded it. u can search it in inditraders. pls make us know how to use it and will it work with amibroker trial. if such a expert adviser available in metastock. if ur site have uploading facility i will try to upload mr rajendran sir. Rajandran Sir can you post a article on afl related to scan stocks which can hit uc in coming sessions or near to the circuit filters in bse? Please download excel sheet with RT feed from Yahoo. This gives buy/sell call during market hours. Please let me know about the results. little change to my previous comment. the excel sheets give buy/sell call, based on pr.day high and low. results will be good if orders are placed before market open. the idea is not to miss the open gap. I tried above changes but it did’nt work pls help me. 1. copied code, pasted in formuls editor, saved it as .afl code. 3. the error pops up! @Dharani : The article is nothing but scanning stocks based on mathematical conditions. Pls help no formula is working i tried explorations and Afl’s from above list but it is showing errors.i tried 5 20 crossover exploration but it is aslo showing errors. Hello, I am new to ami broker. As i am not capable of writing codes in amibroker so could any one help in writing a filter with slow stochastic for any time frame, to show which and how many stocks are trading in overbought and oversold conditions with price more than Rs. 100. If any body could help me in this, specially Mr. Rajandran sir. Please help. “Stock open gap up or gap down and current rate are running above open or below open afl scanner for amibroker” please send me. The afl that u demonstrated , showed 100’s of stocks in amibroker. How to choose best among them? I can not buy 100’s of stock.I can buy max of 5,how choose 5 from 100.
if i take any such indicator . and i want notification in real time say whenever a buy arrow comes or a sell arrow comes a notification comes. from a watch list of say 100 stocks further can the same be done across multi tfs also ? please put a you tube video using your own supertrend afl . Will try it out. Personally Amibroker i dont prefer setting an rule based Popup or Sound Alerts with Amibroker. Apart from that Amibroker is the Best. even if the results are displayed in the analysis window itself after every arrow on the selected time frames across a universe of say 50 symbols it is enuf. I am reading your old posts from a few months now , i am really happy for helping out new bies like me with important materials. Just a question, if i want to use amibroker exploration to find daily RSI high low for all scrips in watchlist than what code should i use , This can help me in selecting stocks for next days trades. Would like to get Alerts when a particular condition is triggered in my database of Stocks. I use explore function to get list of Stocks breaking Prv day HI- low. Try posting your requirements in Marketcalls community to get assistance on Amibroker Exploration or Scanning. any luck with the video, if you have found out the solution can you tell me where is the link to the video?? looking for scan/Exploration afl which filter 1st fib retracement from last swing high 2nd stock above 20,50,100 ema 3rd price above up trend line in case of up trend and in Dw trend 2nd and 3rd is just opposite. I m new to amibroker. I take guidence from market calls in the course of learning amibroker and daytrading. I encountered one problem in scanning/exploration in amibroker. I get correct results only for few scrips which charts are open. rest of the scrips give results which does not pertain to current price/volume resulting in wrong results. any solution for getting scan results for current data for say nifty cash scrips. I need 200 DMA crossover stocks in the latest session only. Will you please help me with amibroker code. I tried parameter n=1 and also I tried BarsSince function unsuccessfully. I need your help please. Please mail me the AFL if you can, Looking for a positive reply. Amibroker is a perfect tool for automating your trading process. All you need know is how to play with tools like COM and OLE programming. Rest is all time effort. can you please help me, I need a filter for MA9 crossing above WMA45 with RSI above 50 but not greater than 70 as buy signal, and MA9 crossing below WMA45 and RSI below 40.